Manufactured for the internal connection of telephone systems and other communications equipment. 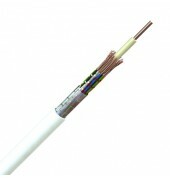 CW1308 is insulated and sheathed with PVC, which offer extremely cost effective telephone cable. Standard sheath colour is white but some sizes are available in black or grey. Solid copper conductor, colour coded PVC insulation, twisted in pairs, ripcord, PVC sheath.